9/11 was painful — but so was the harried decade that followed it. Magnum’s Thomas Hoepker crossed from Manhattan into Queens and then Brooklyn to get closer to the scene. In Williamsburg, he captured the above pastoral scene, but decided to hold back the photo, feeling that it was “ambiguous and confusing.” When finally published on 9/11’s fifth anniversary, the calm scene seemingly challenged the conventional wisdom that “nothing in America will ever be the same again”. But it was a different poem by Auden that was frequently quoted in the days following 9/11: the unmentionable odour of death/offends the September night, he wrote about the month the Second World War began. The couplet clearly underlined the cyclical nature of violence, destruction, and fanaticism, and perhaps it was also fitting that one of the most famous photos from 9/11 was also taken by a man who once covered the D-Day landings — Marty Lederhandler of AP. A veteran photographer of 65 years, Lederhandler had seen plenty of fires and explosions; his advanced age prevented him from heading out to the WTC site, so the 84-year old photographer went to the Rainbow Room on the G.E. Building — now more famously known as 30 Rock, and took a well-framed photo of the disaster before 30 Rock itself was evacuated. Over three thousand people perished that day, but the photographs from 9/11 do not show mangled corpses and bloody carnage. There was an agreement among print media and television broadcasters not to show any corpses in connection with the attacks, and when the above picture by Todd Maisel, titled “The Hand, 9/11” appeared in the New York Daily News, it was roundly criticized. But in the following years, this decency and deference that the American media maintained towards the government will be strained. Photographs of military funerals, coffins and even deaths and injuries will be banned by an administration which insisted that the control of information is vital to national security. Many photographers would find restrictions and censorships of an embedded assignment suffocating, but such assignments became a new normal in the symbiotic and uneasy relationship between the military and the media. David Surowiecki took the above photo of people jumping off the towers. On September 11, Richard Drew was also covering the Fall Fashion Week. He rushed to the site, where he captured the dramatic pictures of the people jumping out of the towers. In most American newspapers, his photos ran once and were never seen again; the memories of “jumpers” were so heartrending, their plunges so traumatic and their suicides so stigmatic that officially and journalistically, they ceased to exist. In official records, nobody had jumped; no one had ever been a jumper. Instead, people fell or were forced out by the heat, the smoke and the flames. A decade on, this denial still holds. The 9/11 Museum will consign the story of the jumpers into a hidden alcove, and there is widespread reluctance to DNA-identify the remains. In that sense, the jumpers were modern unknown soldiers, and their pictures, the photographic equivalent of the Tomb of the Unknown Soldier. We will never know truly their motives, but retellings of the jumpers’ stories were at best a measured alteration of history, and a signal of many such revisions to come, as politicians and pundits continue to hijack the narrative and legacy of 9/11. Nowhere was this hijacking more blatant than in 9/11 Truther Movement, which held that the American Government perpetrated the attacks and the subsequent cover-up as casus bellorum for Afghanistan and Iraq. One of their claim was that the Pentagon was attacked by a missile, rather than a plane. The above photo taken by Daryl Donley, one of the first photographers to arrive to the Pentagon, became a centerpiece of their argument. Blithely ignoring many eyewitnesses who saw a plane crash, and large pieces of airplane debris recovered from the site, they continue to protest shrilly that there was no plane in Donley’s photo. With these portentous words, the White House Chief of Staff Andrew Card informed President Bush of the attacks. Bush was reading to a class of Florida schoolchildren, and his shock was palpable. Seldom are such crucial moments of a presidency recorded live, and for Bush it was an especially watershed moment. Previously, he had repeated said he was more interested in nation building at home than interventions abroad, but he would ironically find himself becoming a close ally with a country whose leader’s name he famously forgot. Not wishing to alarm the kids, Bush remained in that classroom for few more minutes; while the president was initially lauded for his grace, as criticism grew in the following years, the “Pet Goat” moment was increasingly pointed out as symptomatic of his dithering presidency. AP’s photographer Doug Mills was the only photographer to accompany President Bush to the presidential evacuation center in Nebraska and then back to Washington. On September 14th, Mills captured President Bush standing front of the World Trade Center debris with firefighter Bob Beckwith. With megaphone in hand, Bush applauded the crowd of rescue workers with the confidence of the Andover cheerleader he once was. Inside the National Cathedral, Bush became, in the words of the officiating priest, “our George”; religious undertones were abundantly clear. And ironically for a president who would since give his name to linguistic maladroitness, Bush’s speech and grace immediately following the disaster were compared to those of Churchill and Roosevelt. But Bush would find this journalistic and international good-will short-lived. Seven years later, he would enter the records dubiously as a president who enjoyed both the highest and the lowest approval ratings in history. John Labriola, who had an office on the 71st Floor of the Tower One snapped this photo of firefighter Mike Kehoe rushing up the Tower One as Labriola was evacuating. The photo was taken just minutes before the tower collapsed, and when the Daily Mirror ran the next morning, the editors were uncertain whether he survived or not. Six of his colleagues who went up the same staircase died, but Kehoe survived, and the photo won him instant acclaim; Tony Blair held up the photo to proclaim, “This man is a hero.” He also found unwanted attention from reporters, well-wishers and stalkers. The photo perfectly encapsulates the dedication of 343 firefighters who perished, and thousands of other first responders, law enforcement officials and ordinary heroes that day. But sadly, their stories also represent the ephemeral nature of the unity achieved on 9/11. A decade on, political horse-trading would lead to the responders being denied medical coverage and compensation. In doing so, the political classes displayed their moral spinelessness and hypocrisy, while the media — which took months even to remove miniature American flags from their screens — refused to cover it. One can reflect the bitter irony that the debate over the first responders has became such a frenzied charade that a comedian became its voice of sound reason. (See Jon Stewart’s emotional return to latenight after 9/11). As the global finance wobbled in the recent years, the above photo by Susan Ogrocki (Reuters) became one of my favorite 9/11 photos. Taken right around the corner from the Ground Zero, the photo reminds me that the attacks were a seminal event for the global finance too, not least because the target was at the heart of American fiance. Before September 2001, the United States entered a recession caused by the dotcom crash; after 9/11. The Federal Reserve repeatedly intervened by halving the interest rates, and after 9/11, these interventions only intensified and it pumped in over $100 billion into the financial system to calm the markets. The nation went on war footing, and the congress also embarked on a vast spending spree for rebuilding, counterterrorism and defense. There was no doubt that the global economy benefited from these massive spendings, but coming as they did after the dotcom crash, the regrowth introduced a delusion that boom-bust-cycle has been broken. Housing prices increased again, and mortgage rates plummeted — a trend that continued right until 2007. Causes of the current financial crisis are complex, but in the financial detoxification we are currently going through, one can find consequences of many poisons 9/11 engendered. Many seminal events of the last decade didn’t happen just because of 9/11, but there is no denying that 9/11’s significance — both real and imaginary — is huge. Like a black hole, it produced a force so large, so dark and so unfathomably that it rearranged the geopolitical heavens. The long shadows of the Twin Towers, and the vacuum their destruction created both came to dominate the decade that followed it. It was perhaps a paradox best underlined by the Ground Zero — simultaneously a hallowed ground and an open wound. Iconic Photos looks back at the most powerful images from the day that created thousands of them. Apart from annual national holidays, history scarcely invokes events by the dates on which they occurred, but September 11 immediately joined the Fifth of November and the Ides of March as a day that would forever live in infamy. And this month, newspapers, magazines and blogs will commemorate the tenth anniversary of that harrowing day. Some will be personal and introspective, others will invoke history’s long arc, and we at IP will take a photographic trip down the memory lane back to that September morning everyone claims he remember vividly. There are two approaches and two parts to this retrospective. In the first part today, we will try to forget the Pandora’s Box that epochal day opened; imagine you know nothing about the Afghan and Iraq Wars; the Patriot Act; the missing WMDs; wiretappings, Gitmo and secret renditions; Abu Gharib; Madrid and London attacks; bin Laden’s demise or countless politicians and pundits hijacking the memory of 9/11. Then, the photos posted below will tell you the Story of 9/11 without the thick lenses of the future distorting their historical present. Lead photo: Robert Clark saw the second plane approaching the WTC from his rooftop in Willimasburg, Brooklyn; For these four photos, Clark won the World Press Award. Many photographers were in New York, covering the U.S. Open and the NY Fashion Week. Also, two photographic legends, Steve McCurry and James Nachtwey were also coincidentally in town. For Time magazine, Nachtwey took some of the most powerful images of the day, including the photo above. New York Post’s Bolivar Arellano was just beneath the South Tower when it came crashing down. Bill Biggart heard that the first plane crashed into the WTC on the radio; he rushed to the site, and documented the devastation until the North Tower collapsed and buried him. He was the only photographer killed during the attack. His camera and film were recovered, published in Newsweek on October 19th 2001. They are now in Newseum. Suzanne Plunkett was covering the DKNY fashion show that morning. She raced to the Ground Zero, and as she emerged from the subway at Fulton Street, the towers came down. She took powerful images of panicked people running just before the dustcloud overtook her. She ran for her life hid under a car. Father Mychal Judge, the New York Fire Department’s beloved chaplain became the most famous victim of the attacks. Judge entered the North Tower after administering the Last Rites to the people lying on the streets. Shannon Stapleton (Reuters) took the touching photo of Judge’s body being carried out of the rubble by five men, which instantly became known as American Pieta. Amy Sancetta was enjoying a day off from covering the U.S. Open; on hearing the attacks, her first thoughts were, “Oh, great. Some guy has driven his little twin-engine plane into the trade center, and it’s going to take up my whole day off in the city.” She was justified in this reasoning, for in 1945, just that happened at the Empire State Building. She arrived as the South Tower collapsed and the debris cloud overtook her. After hiding in a parking garage, she emerged back into a “winter wonderland of debris”, and took the above photo of a businessman emerging from the debris. Gulnara Samoilova who lived just four blocks away from the WTC was awaken by the sirens. She entered the south tower, but quickly retreated, and was just outside it when it collapsed. In coming months, as an editor of AP Library, her job came to involve going through the 9/11 photos. Deeply haunted by her memories, she left the AP in 2003. Officer Richard Adamiak yelled at Ruth Fremson after she took his photo as he caught his breath inside the Stage Door Deli. Eight hours after the attack, three firemen took an American flag off a yacht and raised it in the wreckage. The moment, captured by Thomas E. Franklin, evoked the memories of Iwo Jima. A year after the attacks, Franklin reunited with the trio for a new photo, this time with the Statue of Liberty as the background. The flag, however, has since gone missing. In an early attempt to memorialize the day, it was proposed to put up a statue of this moment outside NY fire department’s Brooklyn headquarters, but the proposal collapsed when the fire department (which was 94% white) objected to the proposal’s plan to change two of the white firemen in the photo to a black and a Latino for the statue. 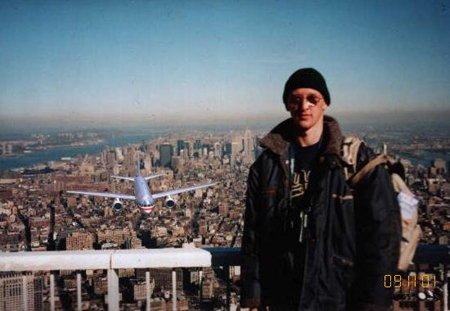 This photo, allegedly recovered from the debris, showed a tourist standing on the viewing platform of the World Trade Center as the hijacked plane approaches. The photo was, in fact, a fake, created from a photo one Hungarian tourist named Péter Guzli took in 1997. Exposed, it became an early internet meme, with Guzli cameoing at many disasters. Tomorrow, we will take a different approach. We will look back at the 9/11 photos that were controversial, and those that shaped the national discourse, while contemplating the morally, politically, militarily, and financially exhausting decade that 9/11 created. As always, follow me on Twitter, and also, suggest your favorite iconic 9/11 photo in the comments below. Best. David Plotz, deputy editor of the online magazine Slate, reacted vehemently. “Those New Yorkers Weren’t Relaxing!,” read the headline. The subjects, he interpreted, “have looked away from the towers for a moment not because they’re bored with 9/11, but because they’re citizens participating in the most important act in a democracy — civic debate.” Plotz argued that Rich took a “cheap shot,” and he called for a response from any of the subjects. Time Magazine’s black border on it’s 9/11 special issue cover was subtle but it delivered a dramatic statement. The magazine, along with Coca Cola, McDonalds and Disney is one of the great American consumerist institutions. An appearance on its hallowed covers, whether it’s of an individual, an organisation, a movement, an event or a trend has long been, and still is, a statement of having arrived, of having made a mark in history. Although the fonts on the cover changed frequently as the decades progressed, the red border of the magazine, introduced in 1927, was an industry standard, like the Financial Times being pink. (The magazine tried a bright orange table of contents pre-1927.) The red border has only been dropped twice, both in the recent years. The first break with the tradition came for the issue of the 9-11 attacks, above, which was put out just 36 hours after the horrific events of that day. The only issue in the magazine’s history delivered without any advertisement, it sold 3.4 million copies, the most ever. On the cover was a photo taken by Lyle Owerko. On the back cover was the photo of the Statue of Liberty engulfed in smoke and ash. “The 9/11 attacks on New York and Washington — like those that preceded it in East Africa in 1998 and those that followed in London, Madrid, Bali and other places — were tactical successes, in that they managed to kill hundreds of innocents, grab the world’s headlines and briefly dominate the nightmares of Western policy makers.” It was a flawed ‘pursuit of politics by other means’ as Clausewitz wrote two centuries earlier, and in this aspect it failed miserably. Eight years on, “Bin Laden’s strategy to launch a global Islamist revolution aimed at ending U.S. influence in Muslim countries, overthrowing regimes there allied with Washington, and putting al-Qaeda at the head of a global Islamist insurgency whose objective was to restore the rule of the Islamic Caliphate that had once ruled territory stretching from Moorish Spain through much of Asia” remains an impossible dream. The flaw was from the start–so repulsive was the mass murder of innocents to ordinary Muslims that most refused to celebrate the attacks, as Bin Laden had hoped they might. By invading Iraq, the Bush Administration did a far more effective job than Bin Laden of weakening U.S. influence in the Muslim world. Yet, even in Iraq, al-Qaeda’s effort to gain control of the resistance failed because its ideology and tactics were so loathsome even to the bulk of the young Sunni insurgents fighting the Americans. In Afghanistan, Bin Laden’s erstwhile cronies, the Taliban, now exists entirely independently of Bin Laden. Today, of course, al-Qaeda is believed to comprise a couple of hundred desperate men, their core leaders hiding out in Pakistan’s tribal wilds and under constant threat of attack by ever-present U.S. drone aircraft, their vituperative reactions reduced from explosions to videos from its hideouts, many of them directed at the likes of Iran and Hamas. Indeed, their place in Western nightmares and security assessments long-since usurped by such longtime rivals as Iran, Hizballah, Hamas and the Muslim Brotherhood. This year’s official threat assessment by the U.S. Directorate of National Intelligence cited the primary security challenge facing the U.S. as the global economic downturn. Bin Laden imagined that 9/11 would anoint him the head of a resurgent Caliphate in the making, but instead it has reduced him, and his movement, to a life of duck-and-cover in Pakistan’s wild frontier — and a political address otherwise known as oblivion. History marches on without them. One of the most influential living photographers today is American James Nachtwey, who had captured tumultuous events in South Africa, Latin America, the Middle East, Russia, Eastern Europe, and the former Soviet Union. He shot pictures of war, conflict and famine, and images of socio-political issues (pollution, crime and punishment). He won coveted Robert Capa Gold Medal an unprecedented 5 times. Nachtwey was one of the first photographers to respond to the events of 9/11 because he lives just a few blocks away from the World Trade Center site. His above photo captures the moment when the South Tower collapsed; even in that early moments of War on Terror, Nachtwey saw the comforting presence of a religious icon and also the conflict between the Judeo-Christian West and the Islamic Middle East. The photo was the centrepiece of his photoessay, Shattered. See his TED talk here. Hours after the 9/11 attacks, three firefighters had spontaneously used a U.S. flag taken off a yacht and raised it in the wreckage of the World Trade Center. A newspaper photographer Thomas Franklin captured the scene, creating one of the most memorable flag raising scenes since Iwo Jima. Franklin was working for The Bergen Record newspaper of Passaic, New Jersey. When the first hit hit the Twin Towers, his editor sent him to cover the event, but it was only in that evening that he captured this iconic image. It was 5:01 p.m., eight hours after the attack. Three firemen (left to right, George Johnson of Ladder 157, Dan McWilliams of Ladder 157, and Billy Eisengrein of Rescue 2) — unaware they were being caught on film — were raising an American flag amid the ruins. Franklin, who had just 30 digital frames left in his camera, captured the moment which instantly came to symbolize American resilience in the face of the murders of 2,819 innocent people. The photograph has appeared on the covers of many publications, including Newsweek, USA Today, Parade Sunday Magazine, and People magazine. It was a Pulitzer Prize finalist and the winner of countless awards, and used for a special U.S. Postal Service stamp released in March 2002 to raise funds for families of emergency workers killed or permanently disabled as a result of the 9/11 attacks. Franklin has been a guest on radio and television shows many times, including the Today show (three times), Good Morning America, CNN, Fox Cable Network, and Oprah. A year after the attacks, Franklin reunited with three firefighters for a new shot of the men for his newspaper and Newsweek magazine, this time using the Statue of Liberty as the background. The flag, the day’s most famous artifact, has been missing for five years, so they had to do without. Above, at the stamp unveiling on 11 March 2002. From left to right, Postmaster General Jack Potter, Eisengrein, Johnson, President Bush, Rep. Gary Ackerman (D-N.Y.), McWilliams, and Franklin.